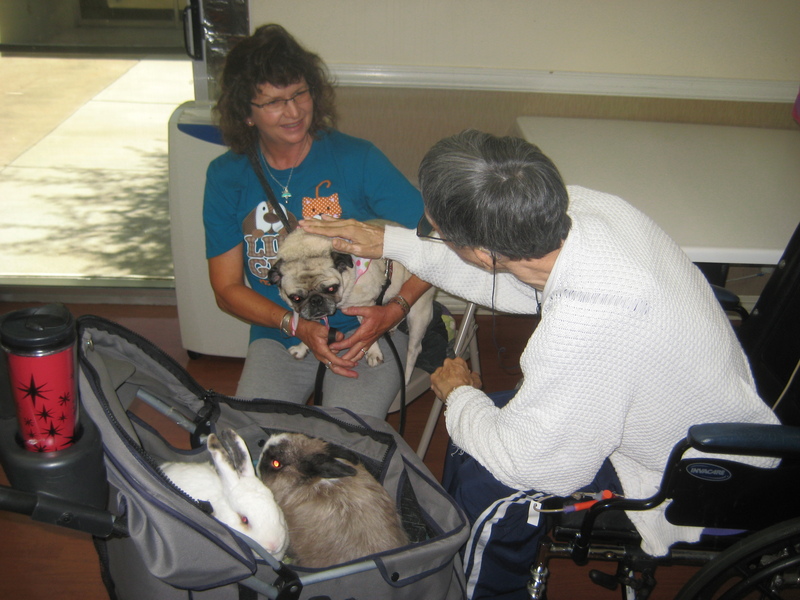 Star and Snickers in their stroller during a therapy session. I thought I would post this blog about Pet Assisted Therapy. My focus has always been education about rabbits and so I almost turned down the opportunity to take a couple of my bunnies to one of these therapy sessions. I know a friend whose bunny went to classes to become a certified therapy rabbit, so I thought that mine would have to do this, too. It turned out that the nursing homes that we have been visiting gladly accepted us to come visit them, without any kind of certification. 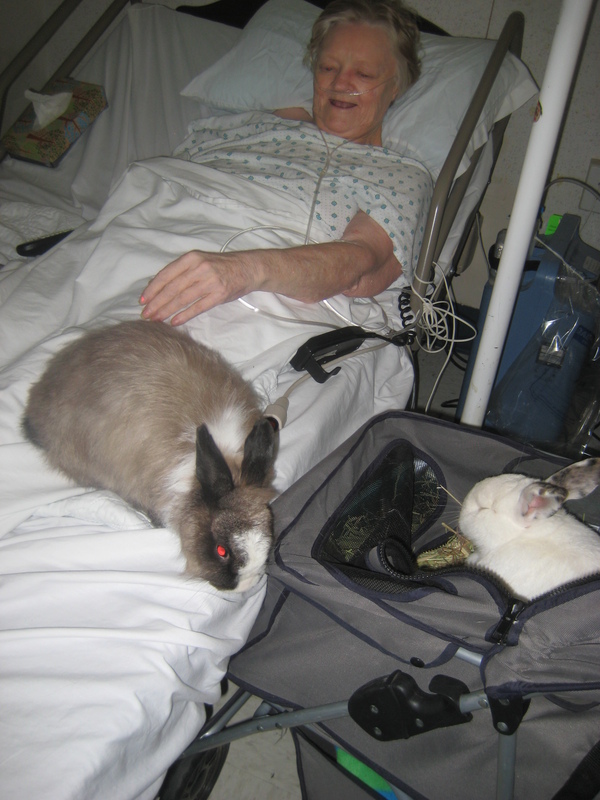 They were so glad that our rabbits were interacting with their patients, no one was worried about their lack of credentials but me. Star is a notorious nipper, but only when she wants to tell you something. Not wanting her to have an excuse to ever nip, I never let anyone hold her during our outings. She usually only nips when she wants to tell you that she needs to use her litter box or wants down from your lap. It is never a hard nip, but it would be totally unacceptable if it happened to a patient. I solved this problem by bringing them inside their stroller. My rabbits love to sit quietly and get ear rubs and pets. Snickers has learned to lean way out of the stroller to beg for pets, if someone tries to ignore him or does not immediately do it. During some of the rounds to visit the bed-ridden patients, Snickers like to hop out of the stroller on his own onto their bed. He thinks it is fun to get some pets and then hop back into his stroller to tell Star all about it. Everyone thinks it is so cute and Snickers has never nipped anyone ever in the year that he has been with us, so I think he is really a perfect rabbit for this. Snickers hopping back and forth entertaining a patient. My point of this article is that this has turned out to be one of the most fun and rewarding things that I do with my rabbits. I am so passionately focused on rabbit education, I initially did not see the value in talking to people who would most likely never have a pet rabbit during their lifetime. What I found instead, was a glow of happiness that they spread where ever they went in the process. I highly recommend that if you have an adventurous rabbit who likes ear rubs to try doing this. The ones that I do are through a local Humane Society. The nursing homes usually make a donation to the shelter in return for our coming to visit, so it is a win-win for everyone. I was very surprised how much my rabbits actually enjoy all of this attention, with Snickers begging for ear rubs and Star smiling while getting pet. The smiles on the faces of the patients are also very heart warming, too. It gives you a good feeling for the next couple days when you think about it. It only takes about an hour once a month, but I have truly grown to enjoy doing it, almost as much as my bunnies do.